I didn’t watch the Golden Globes last night. Honestly…I was watching Downton Abbey. However, I did follow the Red Carpet runway on my phone while watching Downton and I have a few things to say. Where did the glamour go? Maybe that’s in the wrong order. First of all, I continued to see ill fitting dresses on beautiful women. 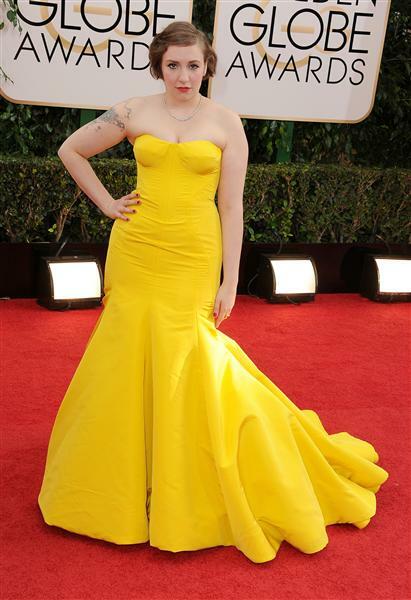 Lena Dunham, whom I love, was top on the ill-fitting list. I actually liked the dress – although the color was wrong for her – but the fit from the waist down was atrocious. Secondly, one of my favorite stars, Jennifer Lawrence, also fell victim to fit, or the lack of. The dress was beautiful, I loved the cut but it was seriously lacking support up top. I’m sure the poor girl spent most of the night tugging at the top of the dress and hoping the double sided tape didn’t fail. What was the aversion to a strap?! This is the Golden Globes people. Not a goth ball. Yet, I saw tons of what I think of as goth inspired designs and really, Elisabeth Moss, this isn’t the Game of Thrones premier. She looked as if she needed to be carrying a sword! Also, Julia Roberts….what was she thinking? Sharon Stone already did the Gap thing years ago! It’s a white button up with a teensy black TUBE TOP sweater and a black skirt? Ok..so it might be a dress but it looks like what I described! Leading to my general statement of “What the &^%(*_ happened?”. « I’m a Lucky Magazine Contributor!